• In May 2015, the Pan American Health Organization (PAHO) issued an alert regarding the first confirmed Zika virus infections in Brazil. Currently, outbreaks are occurring in many countries in the Americas. In December 2015, Puerto Rico reported its first confirmed Zika virus case. • Locally-transmitted Zika virus has not been reported elsewhere in the United States, but cases of Zika have been reported in returning travelers. With the recent outbreaks in the Pacific Islands and South America, the number of Zika cases among travelers visiting or returning to the United States will likely increase. These imported cases may result in local spread of the virus in some areas of the United States. 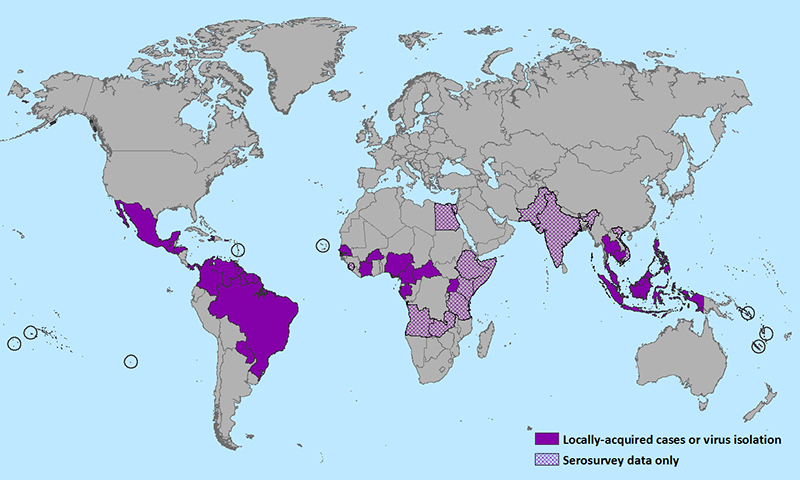 *For these countries, the only evidence of Zika virus transmission is from studies that detected Zika virus antibodies in healthy people. These studies cannot determine where the people were infected or if they were infected with Zika virus because the antibodies may have resulted from infections with other closely related viruses, such as dengue virus.